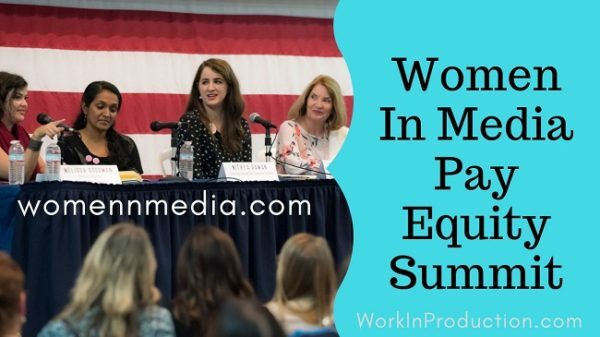 Last week I attended a terrific event co-sponsored by Women in Media, the Pay Equity Summit. The summit panels and town hall discussion addressed the issue of pay disparity between women and men working in entertainment, particularly between traditionally “female” crafts and traditionally “male” occupations, despite the actual work being substantially comparable, and requiring similar skills, training and experience. I heartily recommend Women in Media as a reasonably priced membership organization that is very active in hosting excellent networking and informative events (like a recent live webinar about film financing that was amazingly inspirational) and has a positive mission. The membership benefits include a wide array of great discounts to outside events, services and industry vendors, a jobs board for production work, and the ability to create a profile in the publicly searchable database of crew members available for hire. The other night, at a completely unrelated event – not even a film industry event – I met a producer who had hired from the WiM Crew List for his documentary film! That was cool. For a long time there has been a vague impression that these gender-based disparities exist, but now there is hard data from the first serious study of the matter sponsored by the IATSE Local 871, the local that represents Production Coordinators, amongst other jobs, with a clear rubric to compare the similar responsibilities. The membership of Local 871 is overwhelmingly women/women-identifying. Panelists at the summit included representatives of Locals, professional organizations, and other groups, like Women in Film’s ReFrame initiative, who are specifically working on addressing gender bias in hiring in all the creative and administrative fields across the entertainment industry. The short story is that there are people doing a lot, and plenty of ways to become involved. There are more organizations working to address the pay gap than I realized including the women’s committee of ACLU and several non-profit lobbying groups. However, leading the charge to bring historically “women’s occupations” up to parity is the Local 871. Script Supervisors, overwhelmingly women, work an exacting, detail-oriented task, requiring constant alertness, and whose responsibilities essentially touch just about all other departments on a set. They can be called upon spontaneously for confirmation about any action within a take, for timing, for actor business, for word use, and for refreshing the director’s memory about which take they liked best (and sometimes why). Without their careful paperwork and records, the editing process would be unnecessarily complex. They are the first keepers of continuity. In the olden days, they were given the diminutive “script girl”. So that is how they are now working for lower rates than similarly skilled male dominated jobs. Several other occupation groups were strongly represented on the panels, and various ideas about how to redress this were discussed. One important strategy is to recognize that the IATSE rates are a “floor” from which to negotiate, not a “ceiling”, and to make the negotiations about the work itself, rather than the “hours”. Another is for workers to see each other as allies rather than competitors and present a united front in terms of not accepting low-ball rates from the Union signatories. Yet another is to engage allies among right thinking people of all genders but especially those with the economic power to make a difference, starting with doing a salary audit of your own company. Go here for information about the Parity in Action Pledge. It was very fascinating to attend this event and meet some interesting people who are working using a wide range of pro-active, educational and legislative strategies to bring women’s pay and status in the industry to parity with that of men’s, below the line as well as above it. One of the startling things that I learned was that there is a gap between the rates that Hair Stylists and Makeup artists are paid, two crafts that are so intertwined that on very low budget/non-union shows, the same person will often do both tasks. According to the current IATSE rate agreements, the higher the budget of the film, the wider the pay gap, amounting to a difference between the Head of Makeup and the Head of Hair Styling on a feature film of over $200 per week. The actual disparity is probably much higher given that a typical shoot works longer than 40 hours and the actual hourly rate adjusts for the daily overtime that entails. Over a career, that is a tremendous difference in an individual’s net worth. The rate differences can evidently be traced to the early days of cinema (as many of these issues can) to when the studio makeup artists, especially department heads, were all men, (Max Factor, George Westmore and his many sons, Ben Nye), and the hair dressers were primarily women. I’ve heard that it was not until 1971 that women were allowed to do make up on Studio films. From this you may guess which job gets paid more, and we aren’t talking about SFX or creature makeup. In a side note I will add that it was instant and easy to find numerous online articles about the history of film makeup including naming all those masculine names, but extraordinarily challenging to find the same information about film hair stylists, especially from the early days. Eventually, I was able to find information about one film hairstylist, the first person to receive a screen credit for this job – a man – Sydney Guilaroff, who worked for MGM from the mid-1930’s to the 1970’s. When he died in 1997, he was given the moniker “Stylist to the Stars”. But even in finding this person, it took some trial-and-error Google search strings to get past the first page search results that were mostly movies about hair dressers. As soon as the WiM gallery for the event is put up, I’ll link to it. Meanwhile, here are some links to press about the Pay Equity event, including more of the speakers and their organizations.